Our guide to Counter Tops offers detailed descriptions of companies such as Lewis Cabinet Specialties, Inc. and Connecticut Soapstone. The city of Plano, Texas and entrepreneur Tim Whaley teamed up to create EnviroGlas, an aggregate countertop of recycled glass and non-volatile resins. 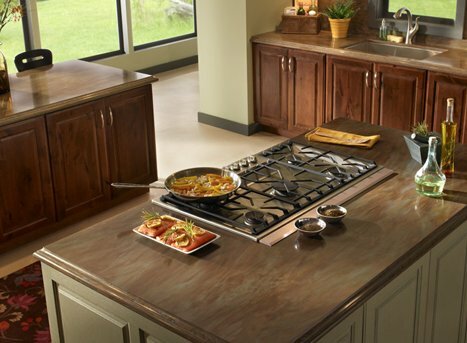 The competitively priced seamless countertop material and planks are impervious to water and acids and heat resistant. International manufacturer and distributor of mosaic tiles of recycled glass and stone and agglomerate countertops of stone recycled glass and resin quartz, natural stone and granite. Manufacturer of environmentally friendly composite countertops made from recycled paper and resembling slate. Teragren is a major American-based manufacturer of bamboo flooring, stair parts, trim, panels, veneer and butcher block countertops. Tempered glass cutting boards, sink mounting systems, stainless steel sink frames, and drawer organizers are among the products offered by this manufacturer with online ordering. Online retailer of knobs, pulls and other cabinet hardware in a variety of styles from antique to European and materials including glass, porcelain, metal and wood. Eco-friendly countertops made of recycled glass, seashells and clay pottery fragments. The cement base binder is environmentally friendly as well. This 120-year-old comapny makes butcher block and wood countertops, as well as stainless countertops and many other kitchen accessories. Handmade, custom countertops, kitchen and bathroom sinks and ventilation hoods in copper, zinc, stainless steel can be ordered through this family-run business. French company produces one of the world's hardest, and most expensive, countertops. PyroLave is highly glazed, volcanic rock extracted from an open-air quarry in an Auvergne crater. Furniture importer Ambella also carries a line of furniture-grade bathroom vanities described as sink chests. Fireplace mantels and lighting are among other offerings. Well-known manufacturer of laminate and solid surface countertops and sheet flooring. This division of MasterBrand Cabinets produces cabinets in wood and laminates for every room in the house. A large variety of styles and finishes, including glass door insets, is offered. New Corian collection spices up the kitchen. 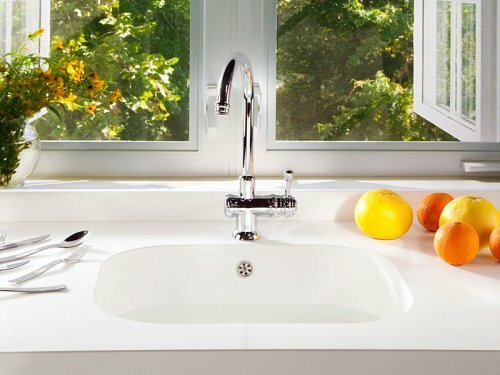 A sink and countertop in one, smooth seam-free piece.